For the duration of my stay in Vrindavan I was fortunate enough to attend the first ever BBT art seminar, taught by the legendary artists, Ramdas Abhirama das and Dhrti dasi. 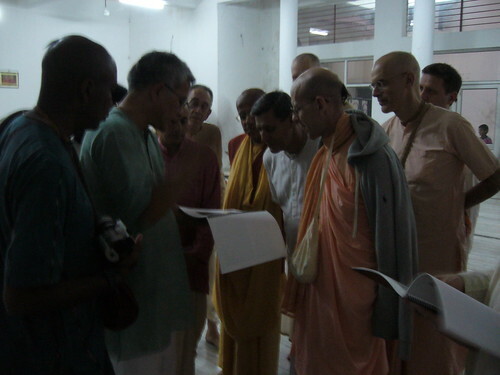 The course was run over three weeks in an apartment block, just down the road from the Krsna Balarama temple. On the first day, along with introductions our teachers gave a short talk about our their experiences, painting for Srila Prabhupada’s books since the very early days. They showed us some of their most famous paintings, and explained the methods they used to inspire and develop them. During the course, we would all be developing one painting of Lord Krsna, which we had been asked to think about before we arrived. As usual, I hadn’t really decided on anything and I soon realised I would have to get to work if I was going to make the most of the course. That night I came up with some ideas, which we then developed the next day. The days soon developed a regular routine. 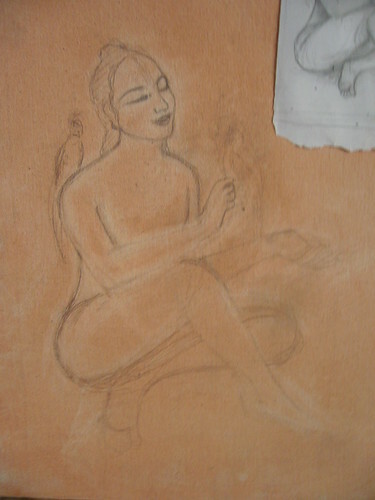 In the morning, we would practise drawing from life, with a young Brijbasi man that had been enlisted for the job. He was initially quite stiff, posing for us as we did one minute, then five and ten minute sketches; but soon he seemed to be quite enjoying it! In the afternoons, we would work on our own painting, first developing the figure sketch; then working on a tonal sketch to map out areas of light and shade; and finally the colour sketch to plan and test our chosen colour palette for the painting. Most of these steps were executed on a very small scale – just tiny thumbnails to give a general picture. 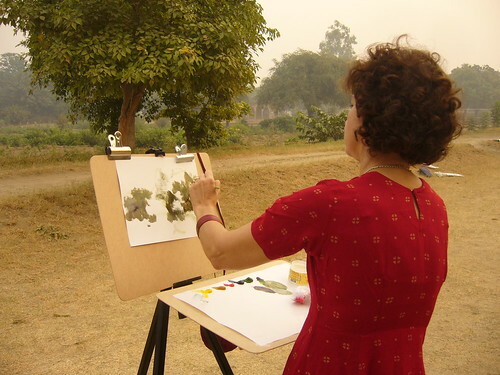 Occasionally, we would meet in the early morning to paint, normally in nearby gardens, or at the goshalla, where we could practise landscape painting as the sun rose. I struggled with it – I had never painted with oils before and never even attempted landscape painting from life, so it was a challenge, but watching others who were more capable, was inspiring and a real education. Ramdas in particular was fascinating to watch. 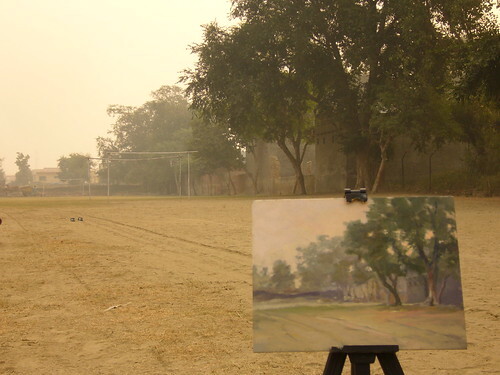 His speciality is outdoor painting and it was amazing to see the landscape appear like magic on his canvas, as he expertly blended the colours. 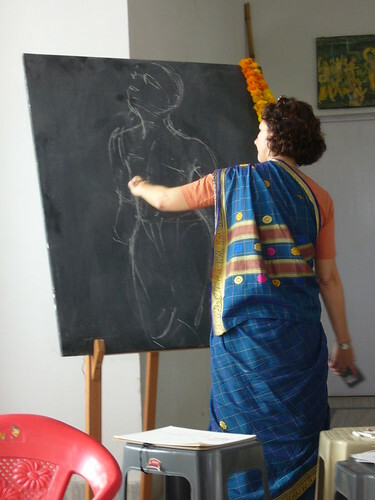 By the end of the second week, most of us were itching to start our paintings after so much preparation, and we soon got stuck in – first sketching, then slowly building up the areas of colour, all the time referring to our preparatory sketches. This experience was totally new to me. I’m not much of a painter, and I almost never have the patience to prepare so thoroughly for a piece of artwork. I had never even done this kind of painting before, where we were striving for such realism. One of the things that Ramdas talked about on the first day was this challenge of presenting the spiritual world. He told us Srila Prabhupada stressed that people shouldn’t look at our paintings and think that these are made up characters and stories. 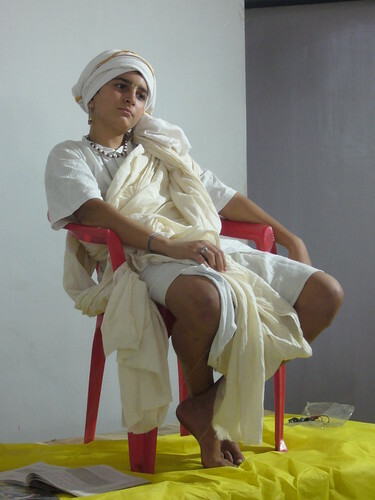 He wanted people to really see and understand that Krsna is real – this was very important in developing the style of painting so unique to ISKCON. The artists drew greatly from paintings from the Renaissance to the 18th century, when traditional techniques and highly realistic portrayal of figures and landscapes were still prevalent. We all tried to remember this as we painted and questions arose constantly. 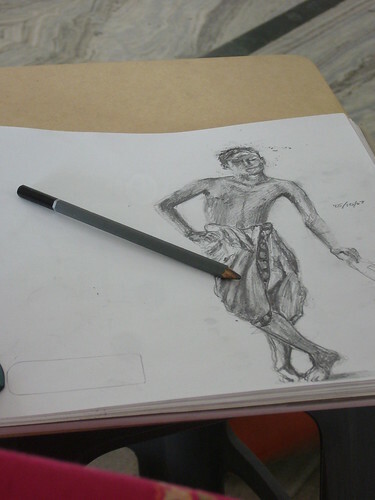 How can I make Krsna’s body look divine, whilst still humanlike and real? How blue is he actually? How much should his facial features be stylised (e.g. lotus eyes) ? Luckily we had such experienced guides on hand to answer all of them for us and this, along with watching them paint every day, gave us invaluable help. I struggled with my painting, right up until the last day or two. I hadn’t done quite enough preparation, especially with the figure and working out the background, and I continually found myself staring at it, not really sure what I wanted to do next. I almost gave up, feeling quite discouraged and lured by the prospect of all the other activities going on during Kartik. However, after some help from Dhrti prabhu, I felt encouraged that I could finish what I had started. On the last afternoon, I painted for hours. The hall where we painted was quiet – most people hadn’t come in that day. Suddenly, the painting began to come to life, to me, almost by accident! I wasn’t quite sure how things were starting to appear but slowly slowly, a background emerged, sunlight came in through the trees, Krsna’s parrots flew in and a pomegranate fell onto the ground! 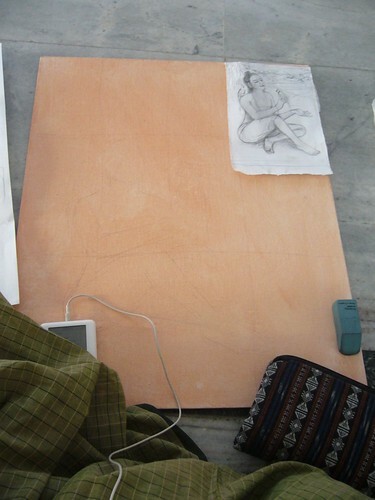 Then I realised that Krsna was helping me. 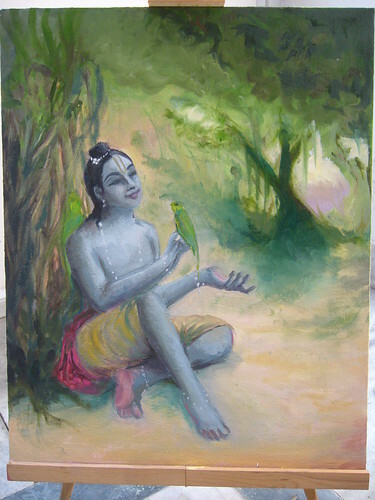 Doing this painting perfectly illustrated to me that Krsna really is the ability in man. 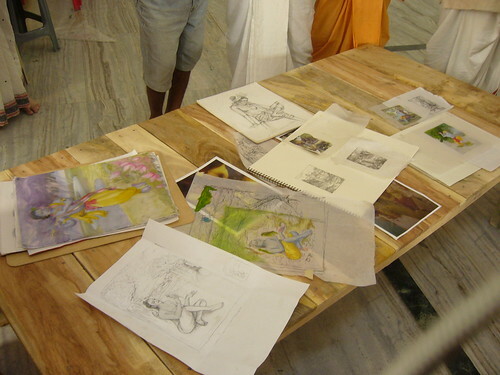 I know I didn’t have the skill to do it myself, but being in the potent surroundings of Sri Vrindavan Dham with such wonderful devotee artists was a special experience. 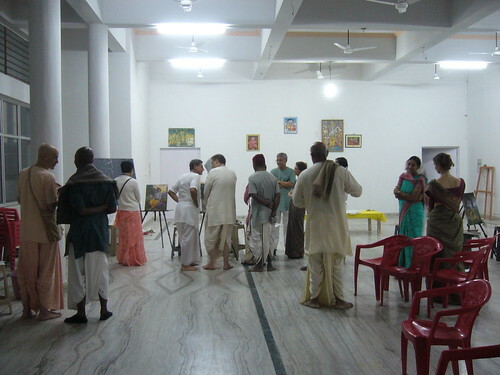 That evening, senior managing members of the BBT came to see our paintings. One of Ramdas’s paintings – he did two! When they were finished, I picked up all my things and carried out my canvas. I prayed that I wouldn’t have any accidents – crashes or splashes – on the way home. 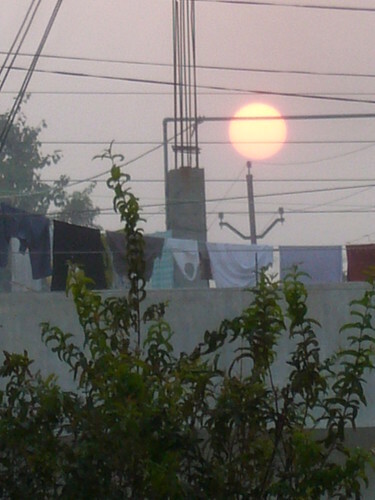 The sun was setting as I walked down the back streets, past rows of ashrams and sleeping cows. I passed a Russian couple who stopped me to look at the painting and exclaimed approvingly(in Russian). 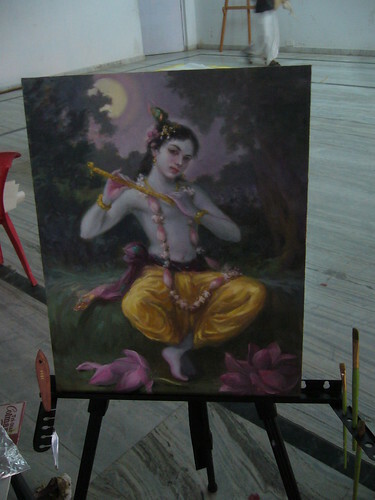 I prayed that they could see Krsna really there in the painting – I realised that that should be the aim. It was a quiet ending to an intensive experience and as I finally reached my room and put down my painting, safe and sound, I felt so grateful to have had the opportunity. It came out beautiful in the end. Well done for putting in all that hard work! I’m glad you’re going to be doing some more; just as Prabhupada wanted, they do really make one think of Krishna and feel attracted to Him. what a great presentation of the art seminar. You covered everything so thoroughly and so inspiring for others in the future. I had no idea you were documenting the class. Loved how you presented the progress with your painting too. It was a pleasure to have met you and worked with you in Vrindavin. 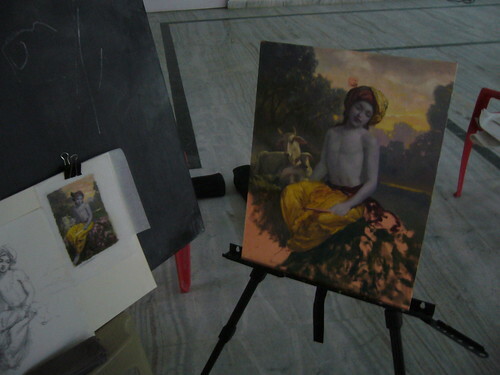 manager of ISKCON youth forum fine art society punjabi bagh ,i also do radha krishna painting. If possible can you kindly inform me if there is a scheduled date for BBT Art Seminar 2008? I want to know this as there is a very talanted devotee in our Manila temple and he is intrested in attending this seminar. Thank you all for giving your time and talent to such a wonderful and exciting project. How beautiful you all look performing your service to the giver of your talents, Lord Krsna. I would love my daughter,Nadia to attend this seminar next year. Nice painting. When is this seminar slated for next year ? Whome should i contact, just know someone who is intrested in it. Your painting is full of life!!! Some great painting and inspiration to all. Ive created ‘Vaishnav Sangha’ in Second Life which is a virtual world, owned and created by its residents. 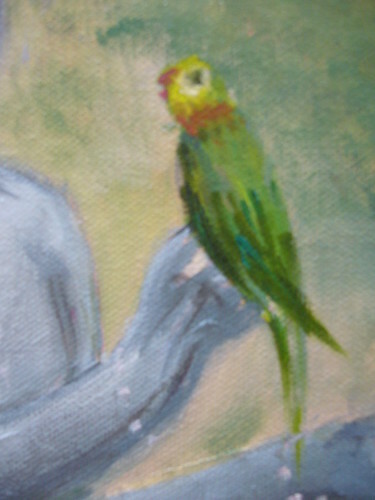 Can i hav some of the paintings which i can post there and can also create a link to ur page. 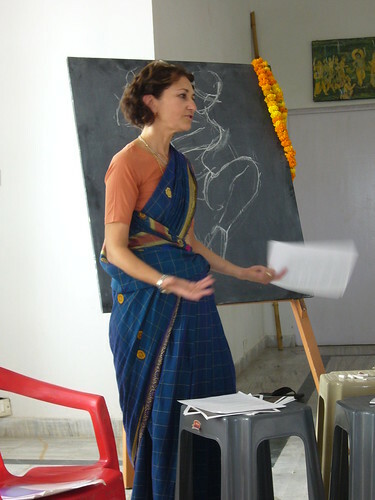 Its great to know of such art seminars. I would love to be informed of the next one, and participate too. Can someone guide me? 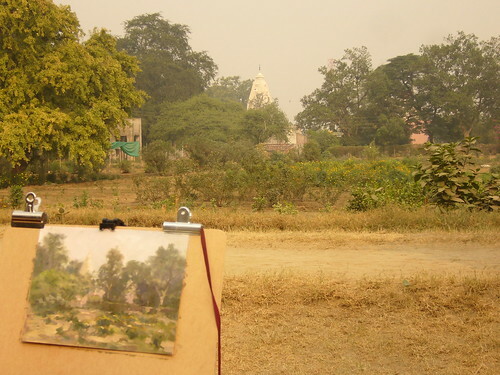 Thank you for the wonderful insight into the Vrndavan art course. I saw it advertised last year and am keen to be one of the students in the future when I have the chance. 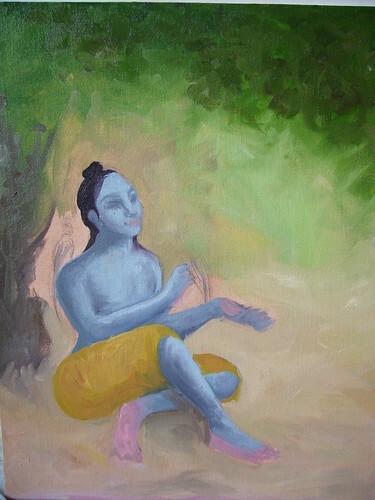 Your painting is very beautiful and shows how quickly you advanced in your ability to produce a painting of Lord Krsna. It is all very inspirational! Keep up the good work. Beautifully executed painting. Would love to learn more about BBt art classes. What a wonderful experience it must have been to be in Gopal’s land and paint his painting. I am completely touched by this blog, thank you for posting it. Your painting worked beautifully – a real talent. ummm. excuse me. but let me get this straight. 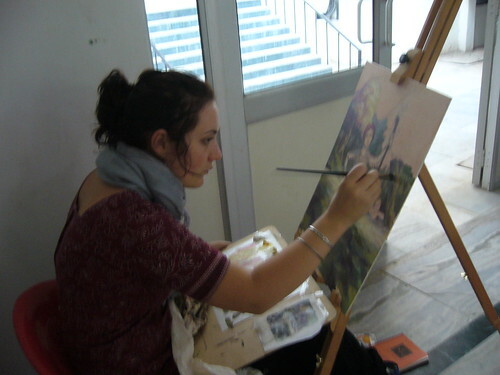 in addition to your many talents–brains, violin, beauty..you also PAINT!!! hold on a minute while i touch your lotus feet. oh wait…i can’t reach them because they are floating 8 feet over my head!!! oh demigoddess…you do not need to learn cooking. simply raise your golden spoon and place it in the cooking vessel. i am sure it will become filled with the most pleasing offering for sri radha and sri krishna. have a good day and thank you again! 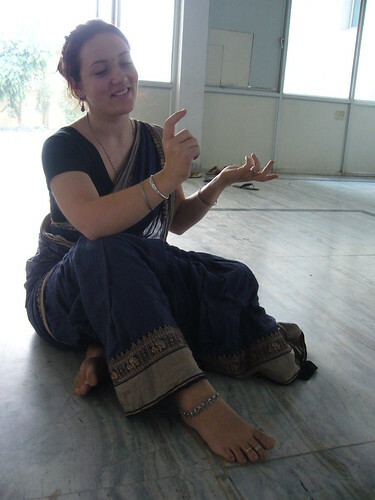 I m a Fine Arts Student in mumbai. I wish to attend the 2009 seminar. Can anyone let me know the dates and when and where to apply for it. The 2008 seminar has already passed, during October/November. I assume the 2009 one will go ahead at the same time next year, and you can apply closer to the time through the BBT website. Good luck! i am very proud and happy to know that the europeans are finally accepting our religion,art and culture . That was a very naive comment from a self proclaimed bhaktha. Religion and service to god is not ‘our’, ‘your’ or ‘their’. The expression differs from place to place but the essence remains the same. Forget about paradharma and focus on your swadharma, you have a lot to catch up on self-realisation. I m waiting for the day when i will b there amongst u all. 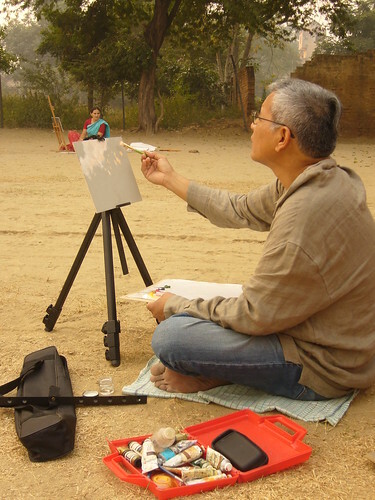 I really pleasured after seeing urs work,and style of work also,and ur type of teaching is too good.Best of luck.I am also a painter in India,so something I understand about art,but it really short knowledge,because Art field is too vast .But urs technique is really acceptable.And in this time that type work is really needy in our society,because it fully coroptedand every heart slowly slowly gone and involved in own created vibreated life,then really I am faithful to u.Thanks for ur doing work.so lets change the world to day.And a creat a new soft heartful world.And creat a sweet tune of flute like KRISHNA’S music. Good art! 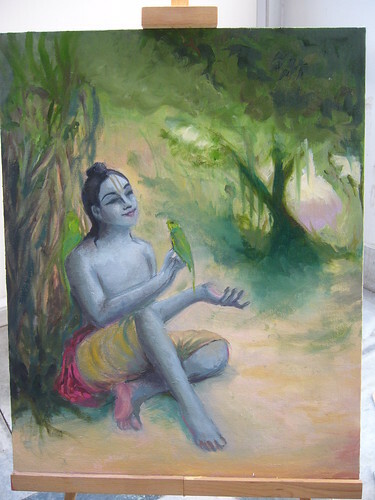 Its nice Devotes can learn haw to paint Krishna ! Thank you so much for sharing your experiences. I actually live half an hour from Dhrti and Ramdas’ house; they are family friends of my mother’s. But I have never taken the opportunity to learn painting from them. Tonight, I went to Dhrti and Ramdas’ house for dinner, and got to see their studio of work they have just recently finished – and wow! It is so amazing and beautiful! 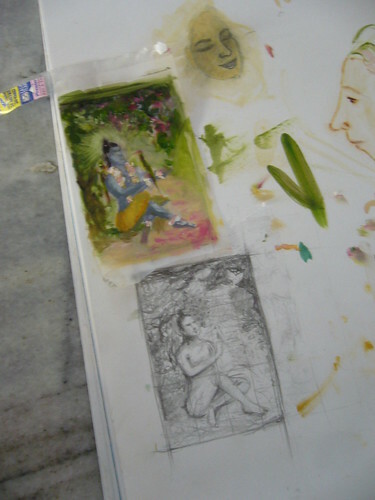 You are so fortunate to have gone to this seminar with them; now I wish I could have gone, and I long to learn from them how I too can paint Sri Krishna. Your post is very inspiring. 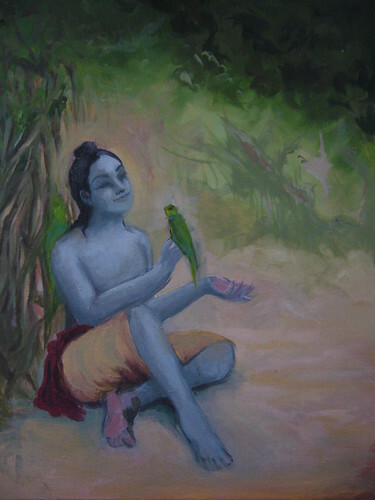 I love how Krishna has inspired you and made you realize, you can paint Him. I would love to see your completed painting some day. 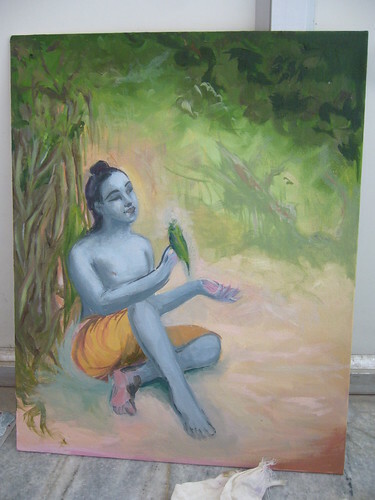 I am very glade to visit this Lord Krishna painting sight.I am first of all a Krishna lover and do painting copy work,original,by modeling and by nature too.I have a speciality in portrait by oil on canvas.Interested devotees may contact for free learning of drawing and painting. im the process of drawing/painting a background for our altar at home… and by Krsna’s arrangement I found this page… very inspirational..
Radha Kanta Dasa – brisbane. Chanced upon your site and am very inspired by the devotion with which the works are done. Best wishers! 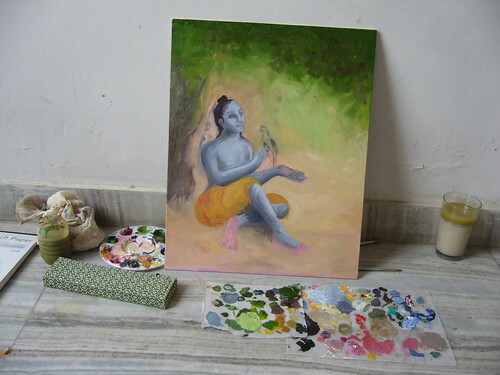 I need someone who is Bangalore based and can paint a life like Lord krishna oil canvas. Please help. It was a pleasure to read about your journey on Krishna Art. 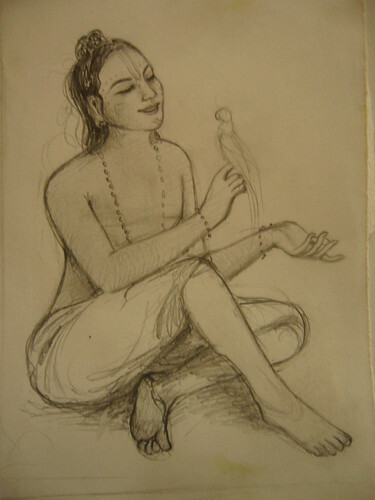 I have been browsing to get involved in the Krishna Art. Could you please direct me to future events of Krishna Art? Saw all the Latest BBT Art Seminar Paintings… Excellent work by Artist. so what exactly develops when it we’ve spoken of on this site attains critical mass – cannot really see that taking too much now , I do hope you guys are set for this since I imagine you’re probably gonna get a lot of enthusiasm if it really does. I also do belly dancing in Spain. I am a dance teacher. I like your creativity.